Gold Radar : New scientific innovation in the world of gold detection and exploration devices, Gold Radar is the result of many trials and lengthy studies, which lasted for more than three years. Gold radar device works on a built radar detection system, to detecting and searching for radioactive ionization of the gold buried underground. The device works on the smart operating and detection systems, through professional interfaces of clarification and control, it also supported also by many advantages and features that make it the first and best of its type globally, the device gives to user a reliable acoustic results and graphical radar and visible results on the screen to the direction of the target and it is through the increase in the levels of sound and graphical indicators, It also paints targets sites on the radar screen and locating a direction, through high concentration by radar detection system and the ability to detects the targets sites and guidance the user with very clearly and integrated data about the target. Gold Radar is one of the easiest devices in dealing in the software, fastest and most accurate of target location detecting. Smart radar system high accuracy and performance of detection and searching techniques. 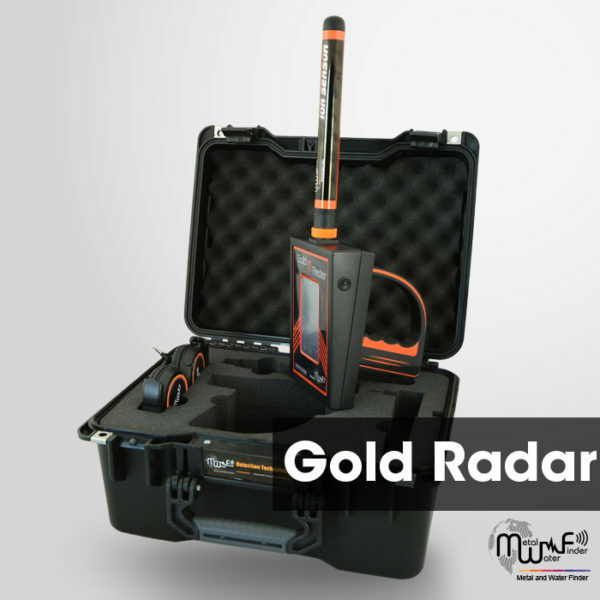 Gold Radar is a Smart detector with a modern operating and detection techniques to detect and search for buried gold underground. New and sophisticated scientific innovation in the world of ionic and radar detection devices specialized in gold detection. TFT color touch screen 3.2-inch HD, gives the user the clear vision by night and day. Interface of radar detection system through a advanced radar detection. Drawing the points and locations of the targets on the radar screen. Clarify the target size by drawing the signal scope on screen systems. Acoustic interactive Indicator, interacts upward whenever get close to point centre of target. Vibration system. Optional, so the user can run vibration alarm to point centre of target. Search inside the old houses. Smart interface settings, gives you a complete control of the device programs settings. Gold Radar supported with digital clock, to watch the time clear, with time and date settings interface. You can use the device inside the car while driving or by driving a motorcycle too, because the device wavelengths speed responsive and can analyse the data signals very quickly. Easy to work and to use anyone can use it. The device is characterized by its small size, helps in ease of movement and work in critical areas. Internal signal filtering systems, to avoid any confusion resulting from any high ranges frequencies of radio waves are present in the air, which affect at many other devices. A system to send and receive the signal, the advanced and accurate (HSW), which is unique to the MWF Group, through the studies and Modern development processes in the signal form and loaded on a paths of High sensitivity waves. Automatic Tuning System (ATS) Special invention and new, registered favour of MWF GROUP, this system provides accurate results and certain in all types of soils and terrain, because the system recognizes the soil automatically, grants the search process automatic tuning commensurate with the type of soil and properties of soil , With the abolition of any overlaps radiation resulting by the rocky and mountainous territory effect , which may affect a lot of other detectors, but the this smart system, can sorting and analysis and provide the necessary levels Which relates of frequency signal, voltage and wavelength of the signal which gives results free of any errors. High quality and accurately performance, manufacturing this product by best elastomers, electronic components and circuits with international standards. Lightweight, which helps the user work done without effort or fatigue. Indicators of graphical radar data, acoustic, oscilloscope and signal strength, and vibration alerts. Yes , by graphical interface to locate the path and direction of the target, and Acoustic commands. It can be stored and work in the degree rate of air humidity of level 90%.